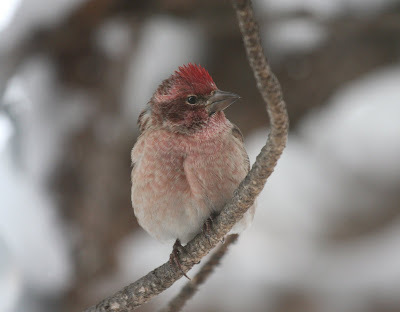 On the 17th of December we scouted for the Boulder Christmas Bird Count which is on the 20th. Our territory is area 17 and it is on the west side of town in the foothills. Our area requires lots of hiking. We hiked up a ridge that topped out on Mount Sanitas where the view was spectacular . . . we could view all of Boulder. 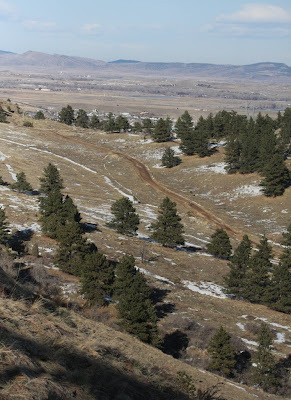 We then winded down the east side of the mountain and followed Sanitas Valley back down to the trailhead. Note: Blood on bill from its previous meal. 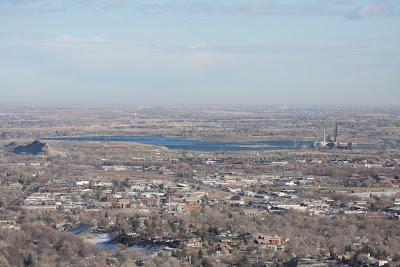 Note: The reservoir in the photo is the Valmont Reservoir Complex. At 5:20 AM we were standing in the Fountain Creek Nature Preserve parking lot with Ted Floyd in Colorado Springs, after an insane 2:45 AM departure from our house to meet up with Ted Floyd for a 3:30 AM departure from Lafayette. Joel counted no less than 50 flaming meteorites during the drive from Lyons to Colorado Springs thanks to the stunning Geminid meteor shower. We trudged down the icy trail in the pre-dawn darkness, hoping for owls, and betting on what our first bird was going to be. That question was soon answered, as a female Great Horned Owl called from across a frozen lake. We stopped at nearly every grove of promising trees, calling for a possible Western Screech-Owl. As the sun started peeking out over the horizon, we stopped hoping for the non-existent screech-owls and turned our attention to the diurnal avi-fauna which was starting to awaken. An American Wigeon called from the river, and a flock of juncos started bustling around. Song, White-crowned, and American Tree Sparrows were also calling from the brush in a dry flood plain. Suddenly a loud, rich, smacking chick (Ted says "like a junco on steroids") caught our attention. We quickly located the Fox Sparrow, which turned out to be the "Red" subspecies! "Red" Fox Sparrows are very rare this far west, so this was an excellent find (with the bonus of being a life bird for Joel)! We watched it for a while before it flew off, following the junco flock. 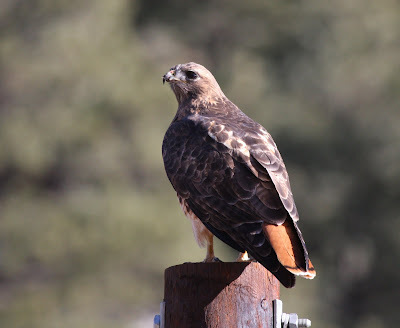 Other highlights include not one, but two Swamp Sparrows (one adult and one juvenile), two Virginia Rails, about eight California Quail (we have no idea how they got there, but we are almost certain that they are not of wild origin), and a "Harlan's" Red-tailed Hawk. After the long return journey to Boulder we stopped by Valmont Reservoir to go "gulling." There was a large flock of gulls out on the edge of the ice, and after methodically sorting through them, we managed to pick out an adult Glaucous Gull (a lifer for Marcel! ), an adult Lesser Black-backed Gull, and two adult Thayer's Gulls from the hordes of Ring-bills. We also found a California Gull and a couple of Herring Gulls, plus an Eared Grebe and a Prairie Falcon. While walking back to the car, we saw an awesome fly-over of thousands of both Canada and Cackling Geese. We tried to pick out some white geese in the fading light, but we were unsuccessful in this task. Our day wasn't over yet! After parting with Ted, we headed north to Berthoud to hear Scott Rashid give his presentation on small mountain owls for the Foothills Audubon. It was an excellent talk, which we highly recommend to anyone who has the opportunity to hear it. We've put his book, Small Mountain Owls, on our wish list. It was a twenty hour day . . . something we'd only do for birds. We apologize for the lack of photos in this post, as we unfortunately left the camera behind in our sleepy 2:30 AM departure. The Harris's Sparrow has met its doom . . . 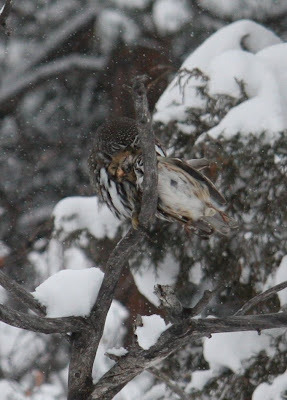 I glanced out the front door at our feeder trees and found myself being stared at by the false eye spots of a Northern Pygmy-Owl. The owl noticed me and took flight towards the creek, lugging with it some very large cargo. My mom got a glimpse of it flying away, while Joel had missed it entirely. Joel quickly slipped his bare feet into our dad’s Crocs, donned a light fleece jacket, grabbed his binoculars and quickly exited out into the miserable 5° F. snowy weather. I, on the other hand, put on cold weather gear and went for the camera equipment only to realize that the long lens was in the car that my dad had driven to work! Joel came back in for warmer clothes (his idea for “warmer” is sneakers in 10 inches of snow, still no gloves) and we both went out, Joel armed with a short lens attached to the 40D and myself carrying a point and shoot with video capability. 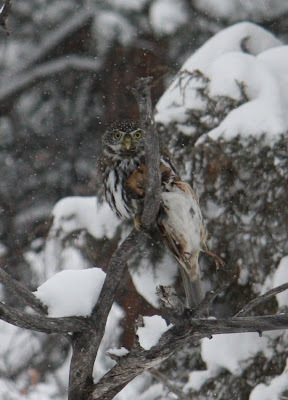 Immediately, Joel and I spotted the small owl sitting in a ponderosa pine with its quarry. It flew off into another, low-lying deciduous shrub and began to rip apart its prey. 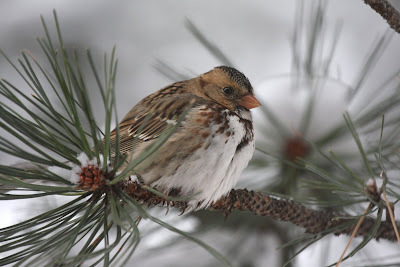 Joel and I crept to within about 15 feet of it and were finally able to identify the victim, the Harris’s Sparrow! 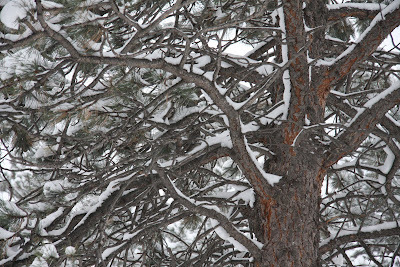 Can you find the Northern Pygmy-Owl? 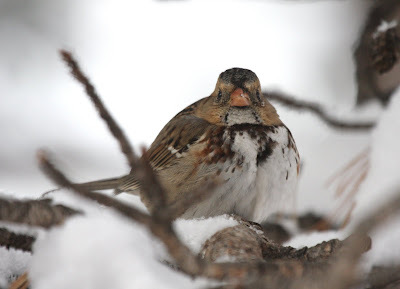 For the past five days, our feeders have been graced by the appearance of a first-winter Harris’s Sparrow. Arriving with the snow storm of December 2nd, it has stayed for nearly a week, resting and tanking up on food. 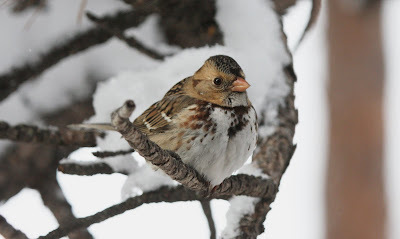 According to Colorado Birds (Andrews & Righter, 1992), the Harris's Sparrow is a very rare visitor to the mountains and foothills with only 22+ records (as of 1992). We don't know how many records there are by now. These birds commonly winter on the eastern plains, so this young bird presumably got blown west by the storm. We're wondering how long this bird will stay, as another storm came in last night. He had a chance to leave a couple of days ago, but it obviously wasn't ready to go. Harris's Sparrow - life bird/yard bird/great bird!